Another good entry of cattle on offer at Lisnaskea Livestock Sales on January 22nd sold easily to a brisk demand for all sorts. Store bullocks sold to £1,120 for a 590kg Aberdeen Angus (£190) with medium weights selling to £1,030 for a 460kg Charolais (£224) and 430kg Simmental to £945 (£220). 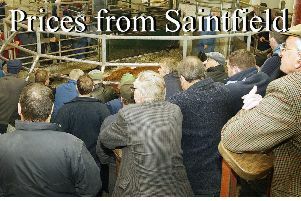 Store heifers sold to £900 for a 520kg Limousin (£173) with medium weights to £880 for a 420kg Charolais (£209). Weanling steers and bulls sold to £800 for a 320kg Charolais (£250) with smaller sorts selling to £615 for a 190kg Charolais (£323). Weanling heifers sold to £805 for a 330kg Charolais (£244) with smaller ones selling to £670 for a 240kg Charolais (£279). Springing heifers sold to £1,050 for a Hereford. Lochard Enniskillen producer 590kg Aberdeen Angus to £1,120 (£190), Rosslea producer 460kg Charolais to £1,050 (£224), Omagh producer 500kg Aberdeen Angus to £955 (£191), 500kg Limousin to £850 and 460kg Limousin to £830. Boho producer 430kg Simmental to £945 (£220), Lisnaskea producer 500kg Hereford to £840 and 480kg Hereford to £760. Lisnaskea producer 520kg Limousin to £900 (£173), 510kg Hereford to £880, 490kg Hereford to £850, 510kg Hereford to £830 and 410kg Hereford to £600. Newtownbutler producer 420kg Charolais to £880 (£209) 390kg, Charolais to £845 (£216), 450kg Charolais to £820, 450kg Simmental to £810, and 430kg Charolais to £775. Newtownbutler producer 450kg Limousin to £830. Newtownbutler producer 450kg Limousin to £830, 370kg Limousin to £815. Newtownbutler producer 320kg Charolais to £800 (£250), 340kg Charolais to £795, 290kg Charolais to £720, 290kg Charolais to £705 and 290kg Charolais to £610. Lisnaskea producer 360kg Simmental to £800 and 350kg Simmental to £725. Lisnaskea producer 380kg Charolais to £790 Newtownbutler producer 360kg Limousin to £765 and 290kg Limousin to £690. Florencecourt producer 310kg Hereford to £755, 300kg Limousin to £740, 290kg Limousin to £670, and 320kg Limousin to £640. Derrylin producer 330kg Limousin to £750. Boho producer 340kg Blonde d’Aquitaine to £740. Sligo Road producer 330kg Aberdeen Angus to £700 and 300kg Aberdeen Angus to £700. Newtownbutler producer 260kg Charolais to £690 (£265) and 280kg Aberdeen Angus to £605. Kinawley producer 250kg Charolais to £685 (£274), Newtownbutler producer 230kg Charolais to £635 (£276), Aghalane producer 190kg Charolais to £615 (£323), Lisnaskea producer 210kg Limousin to £560 (£266) and Newtownbutler producer 220kg Limousin to £555. Lisnaskea producer 320kg Charolais to £805 (£244), 260kg Charolais to £655 (£252), 260kg Charolais to £625, (£240), 280kg Limousin to £625, 290kg Charolais to £620, 240kg Charolais to £615 (£256), 230kg Charolais to £600 (£261), Blaney producer 330kg Limousin to £800 (£242) and 300kg Limousin to £700 (£233), Newtownbutler producer 320kg Limousin to £775 (£242), 320kg Limousin to £660, 280kg Limousin to £650, 260kg Limousin to £595 and 270kg Limousin to £570. Lochard Enniskillen producer 380kg Charolais to £775 and 330kg Charolais to £755. Boho producer 290kg Blonde d’Aquitaine to £760 (£262), Derrylin producer 330kg Limousin to £695, 270kg Limousin to £630, 290kg Shorthorn to £565 and 240kg Limousin to £500. Lisnaskea producer 320kg Limousin to £695, 350kg Limousin to £650, 270kg Charolais to £605 and 210kg Limousin to £450. Florencecourt producer 270kg Limousin to £675. Magheraveely producer 340kg Charolais to £670. Aghalane producer 240kg Charolais to £670 (£279), Newtownbutler producer 350kg Limousin to £660 and 310kg Limousin to £615. Newtownbutler producer 350kg Charolais to £660, 280kg Charolais to £600, 330kg Charolais to £550 and 310kg Simmental to £520. Kinawley producer 240kg Limousin to £535 and 190kg Limousin to £475. Lots more stock required to supply a strong demand for all sorts.